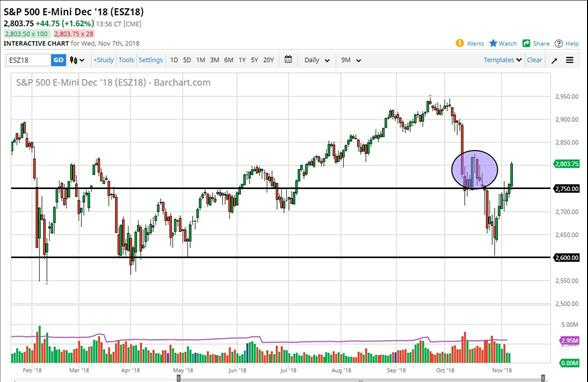 The S & P 500 rose rather significantly during the trading session on Wednesday, breaking above the 2800 level initially. Ultimately, this is a good sign that we may try to break out to the upside, so I think that buying short-term pullbacks will probably continue to be the case. I like the idea of using the 2750 level as support now, assuming we even get down there. I think the stock market is more or less just simply relieved that we have the elections out of the way. There is probably the thought process that Trump won't be able to really stick it to the Chinese as far as a trade war is concerned, but I think the stock market might be surprised at just how interested the Democrats may be in punishing the Chinese as they are very pro-labor. Nonetheless, it looks like we are going much higher in the short term. The NASDAQ 100 exploded to the upside during the day, breaking above the shooting star from the Friday session, a very good sign indeed. If we can continue to stay above the 7000 handle, I think that this market will continue to find buyers on dips. Be cautious, and certainly take your time because you can get hurt after these huge moves if you try to jump in right away. That doesn't mean that the market can go higher right away, but I think short-term pullbacks are probably the best way to take advantage of what is turning out to be a very strong move, and I think that we may try to get back to the highs again, but it is obviously going to take some time to get there. I think short-term pullbacks continue to be very attractive.